To know the part one, please back read the chapter . Isogai who saw everything in your room is really embarrassing! You&apos;re just writing things and now he thought you really like him which is not true. But actually, you don&apos;t know what you feel about him. You keep taking his picture and stuffs as a memory. Sometimes, his stuffs suddenly got lost even the important because of you. Your feeling for him is kind of confusing. You act like you didn&apos;t care but you were exploding of embarrassment of all he did. "I&apos;m ready to go, are you ready?" You nervously ask as he wears his school shoes. "Yeah," he simply replied. "We should get going," you said and open the door. He follows you through the gate. It was an awkward silent you&apos;ve tried to break the silence but no words came out your mind. "U-uhm.. I can carry your bag for you if you won&apos;t mind," he broke the silent blushing furiously averting his eyes away from you. You couldn&apos;t help it but smile as you accepted his offer. While climbing up to reach the school, everyone in the school started squeling as they both saw you together. You glare at them as they try to tease you. Not long, Koro-sensei arrived with a random things that he bought from another country. "Good question from a womanizing star, its a love calculator made from the aliens at Saturn. They were so happy to see me and they gave me one of the precious thing they loved." Koro-sensei wink to Maehara as his eyes widen and happily run to him. "Koro-sensei! Is that mean ill found out my love of my life?!" "Yes,Yes, Maehara-KUN ITS AN AWESOME COMPUTER IN THAT PLANET!" "Ne, ne, Koro-sensei, can I found ut who&apos;s (last name-san)&apos;s future husband?" Touka asks with a smirk on her face Nakamura nodded in agreement with an evil smirk on their faces. "Wait, wait, wait! It depends on the future! I dont need a comp-" you were cut off by Kayano who is your best, best friend ever and she wink at you. "Hey guys, you dont need a computer,"
"Thank you Kayano-chan!" you were about to hug her cut you with an evil smirk. "Kayano..Chan?" "You&apos;re not along with us?" Touka and Nakamura ask. "Nope.. BUT!" she evilly smirk which creeped you. "We already knew who her future husband is," she glance at Isogai who was there all the time. YOu&apos;ve just realize he was there and you glare at Kayano. Isogai blush deeply as Kayano said that. "Cut it off guys!" you said even blushing too. "Yie~ Looks like someone was just hit by an arrow of cupid," Karma came along with a smirk. "No way! (first name) is mine!" Maehara said making Isogai jealous. "Haha, someone even got jealous!" Maehara also came along with other. "Oh come on just let it out guys so this will be over!" Nakamura said which made you both stunned. "N-no I.. Wont accept that." you cut it off and sigh. "I wont ever let that happened." you walk out of the group and get in the classroom first you saw Itona working something alone and you sigh. Probably it was just a new weapon for Koro-sensei. "Don&apos;t worry, (last name)- san. That so-called electronic of Koro-sensei is broken,"
"Huh?" you look at him . "Well.. Its broken that is why it was given to him,"
"Pfft.. HAHA cursed them," you said and laugh. "But.. I&apos;ll be remaking it now, so its finished and i&apos;ll try to communicate to the future,"
"Huh?! Is that even impossible?!" you stood up and rush into him. "I wanted to see my future!" "Wel.. I&apos;ll try." he said with a smile on his face. "Ho-ho, is that why you dont wanted to accept our poor Class Rep.?" Nakamura whose near at the door and Isogai&apos;s expression was painful to see as he enetered the classroom. "What are you talking about? I do not. 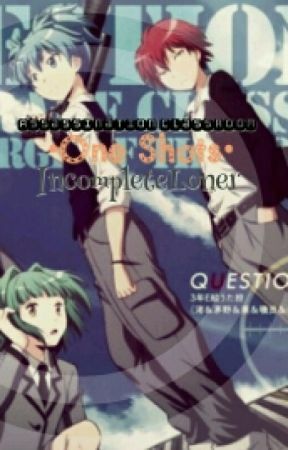 And you&apos;ve misunder-" a sudden shock cut your sentence and its Isogai&apos;s book that just fell which a silent fall from the classroom. "okay,okay, students, I&apos;m sorry to force you see my best computer technology that has been broken for all the time that i didnt even notice, but anyways.. Go back to your seats and I&apos;ll start now,"
Before you go back to your seat you reached for his book that just fell and put it on his desk. "I-I.."
"Its okay, I&apos;m sorry for expecting and assuming always and thanks." He smiled to you that a painful aches your heart seeing Isogai in that pain. After that, you didnt reply and go back to your seat as the class ended. Isogai left the class earlier make you snap back what happen. You wanted to run to rush up to him but you have a duty to work. Nakamura and the other girls saw that and she grab the broom away from you. "Go and chase him," she smile at you. "I-I.. I-m sorry Nakamura-san" you deeply bowed and get your stuffs. "Good luck," she just said and you run as fast as you can away from the class. You didnt mind on changing your school shoes and run off. You look around the streets to find Isogai but he wasn&apos;t there. You&apos;ve remember that he used to stay at his favorite spot and rush there to see him. You panted hard as you saw his figure there. "I.. Isogai.. Yuuma.. I commanded you to," you pointed at him with tears flowing down your cheeks. "To be mine alone! Be my boyfriend! Yuuma!" His eyes were all widen in surprise yet he didnt mind but rush and hug you tightly. "I-Im sorry.. For saying it late.. Waiting you for how many days." you whisper and hug him back. "You dont know how much I waited you.." you look up to him. He smiled warmly wiped all the tears away from your eyes. "I&apos;ve fallen deeply in love that I wont ever regret." he said. 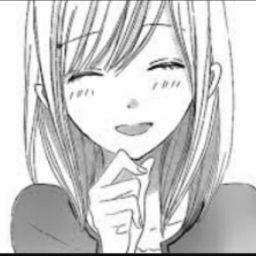 "I did too.." you whisper back with a warm smile. "I really, really do love you," you both said as you both chuckled. He slowly lean against you and you felt your cheeks starting to get red as you thought he&apos;s going to kiss you. You look at his eyes a smile forms his face, he closes his eyes and you do too. I didn&apos;t know that someone will love me this much.. He fixed my phone by resetting it! I didn&apos;t even know hot to fix this but thanks to my soon to be technician brother!